Successfully Added Z69 Plus Android TV Box - Android 7.1.2, Octa-Core, 3GB RAM, 4K Support, 3D Media Support, WiFi, Bluetooth 4.1, Google Play to your Shopping Cart. If you are looking for a powerful Android media player that lets you enjoy the most demanding software without dropping a frame, the Z69 Plus Android TV Box is perfect for you. This little device packs a whopping Octa-Core processor that has been clocked at 1.5GHz. Added to that comes 3GB of RAM as well as its 32GB internal storage. All this powerful hardware is guaranteed to put forth an outstanding performance that lets you tackle the latest games, movies, and TV Apps. 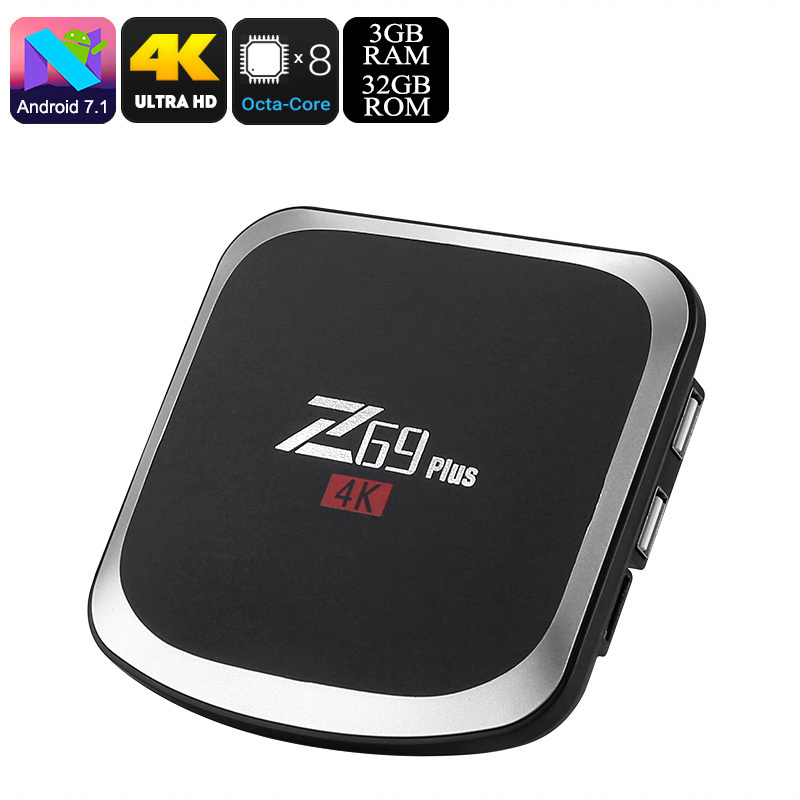 No matter your media demands, the Z69 Plus Android TV Box will handle them all. With 4K support, this Android TV box allows you to watch your favorite media in Ultra-HD resolutions. Whether it’s a film, sports game, or series – from now on you’ll undergo a stunning visual experience. Besides 4K, this Android TV box also supports 3D media files. This will further increase your overall user experience by letting you watch and play stunning 3D games and movies. The media player itself runs on Android 7.1.2, guaranteeing a smooth performance at all times. By treating you to WiFi connectivity, this Android TV box lets you browse the web straight from your big screen TV. With access to Kodi 17.3 and Google Play, you can download millions of entertaining media files for free. You’ll have plenty of storage available, meaning that you can store all the games, Apps, and films of your liking. From now on, you’ll never have to experience a moment of boredom again. The Z69 Plus Android TV Box comes with a 12 months warranty, brought to you by the leader in electronic devices as well as wholesale Android media players..